The FAA can make the rules about air travel (god no inflight calls, please), but it's still beholden to the whims of earth's shifting magnetic field. Runways are named after their compass orientations to help pilots navigate. A changing magnetic field, however, means they now have to be renumbered. This fall, Oakland International Airport became the latest major airport to change its runway signs and repaint its asphalt—all thanks to subtle changes in the earth's electromagnetic forces. Oakland's Runway 27, from which Amelia Earhart flew to Hawaii in the 1930s, is now called Runway 28. The number comes from taking the runway's magnetic compass direction (between zero and 360), rounding to the nearest 10, and taking out the zero. 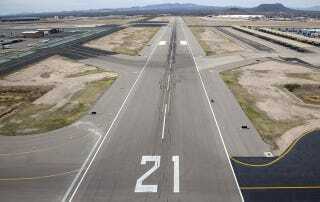 If a runway's direction changes by more than 5 degrees, the FAA requires it be renumbered. The Earth's magnetic field arises from its own substance as the huge body of molten iron in its core stirs with the Earth's rotation and the moon's steadying hand. Electrical currents in the iron generate magnetic fields that struggle against the stirring, acting like a natural turbine and powering the magnetism that draws our compass needles to attention. This sounds busy, and it is. The geomagnetic poles, north and south, are always wandering and must be closely monitored by a network of observatories to keep navigation accurate. As earth's magnetic north pole wanders from its geographic north pole, its magnetic field also changes in different ways for different parts of the world, and it's difficult to predict where the field will shift enough to make a difference for airports. In the past few years, Stansted Airport in London and a handful of airports in Florida, including Tampa's, have also had to renumber their runways.